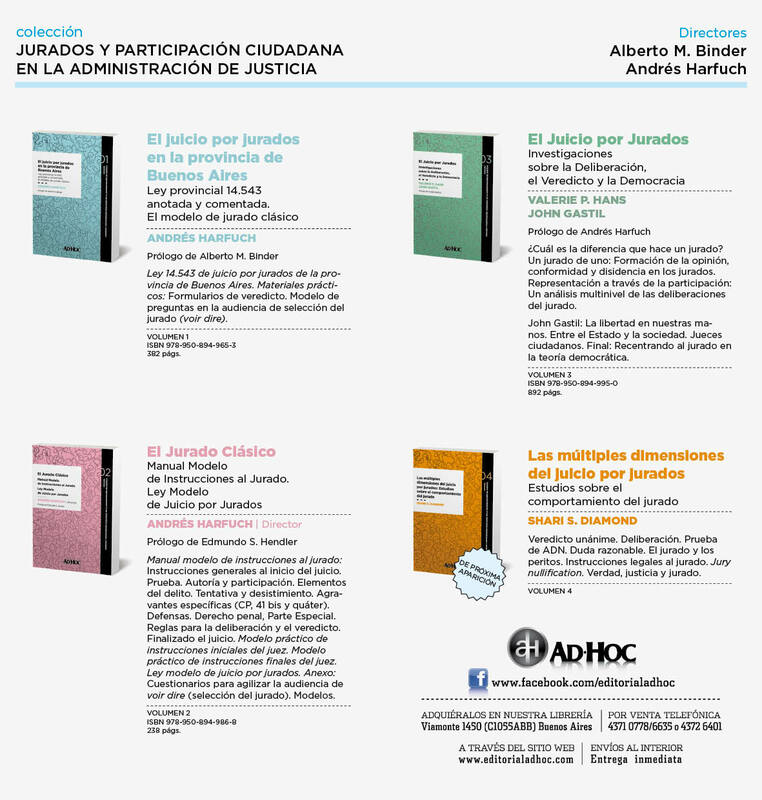 Asociación Argentina de Juicio por Jurados: “There is no turning back on trial by juries," declares the BA High Court of Appeals. “There is no turning back on trial by juries," declares the BA High Court of Appeals. On Monday, the High Court of Appeal for the Province of Buenos Aires affirmed, for the first time in the history of that province, a conviction based on a guilty verdict rendered by a jury. Justices Daniel Carral (presiding) and Ricardo Borinsky, affirmed the conviction for murder against Marcos Ezequiel Mazzón, issued six months ago in the district of La Matanza. Mr Mazzón was sentenced to eleven years in prison. The Court's decision of the verdict has enormous historical significance. It is the first appellate review of a conviction based upon a jury verdict after 162 years of verdicts rendered solely by judges. The Court also addressed two of the major issues raised by legal scholars related to the an appellate court's review of jury verdicts: (1) the authority to review judicial error in instructing the jury and (2) the authority to set aside a verdict on the ground that it is unreasonable in light of the evidence presented at trial. 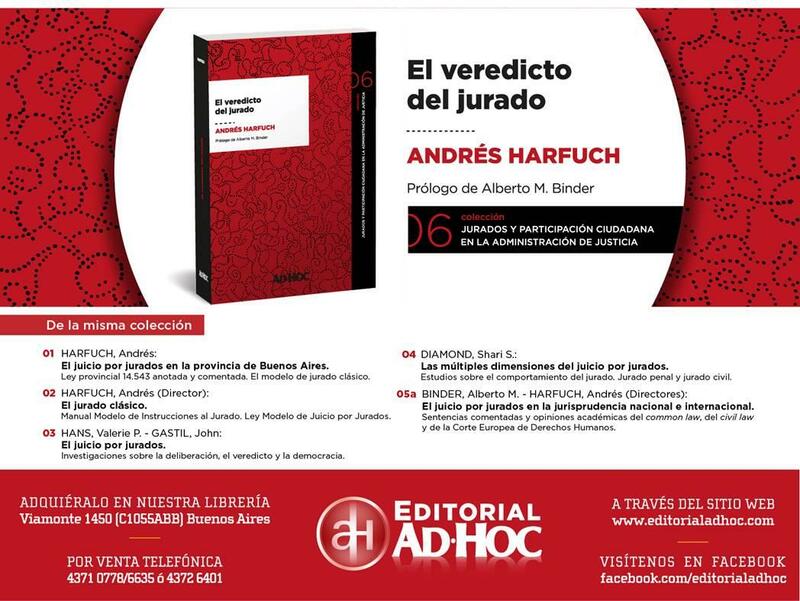 Some critics of jury trials, both In Argentina and in continental Europe, maintain that the general verdict of the jury is unconstitutional because jury verdicts are not based on written opinions and therefore do not allow appeals as required by the International Covenants on Human Rights. This criticism is based on the false premises that the fact that the jury is not required to articulate the basis of the verdict in a written opinion means that its verdict lacks a basis and that that basis cannot be reviewed on appeal. This reasoning is incorrect: while it is true that the defendant who appeals a conviction does not have a written opinion explaining the jury’s reasoning, the appellate court can overturn a conviction if the verdict is unreasonable in light of the evidence presented at trial. In other words, appeal judges can quash a conviction not supported by evidence beyond a reasonable doubt. And that was what exactly happened in the appeal of the Mazzon verdict and in appeals in the the Court of Appeal and the Supreme Court of Justice of Neuquén province. Appellate judges found no difficulty in reviewing the facts and issues identified by the defense attorney despite the jury´s general verdict. To perform this appellate task, the BA and Neuquén justices articulated the objective basis upon which they find that the conclusion reached by the jury is unreasonable. They correctly explain that"this basis is set up from the indictment, the trial record, the instructions of the judge, the briefs from the parties on appeal and the hearing at the Appeal Court”. This start in BA High Court of Appeal could not be more auspicious for the future of the jury trial. The justices emphatically endorsed the institution of a trial by jury and, at the very beginning of their judgement, made it clear that “trial by jury is a constitutional guarantee of fundamental order which cannot be ignored". "This case represents the first the first judgment resulting from the procedure established by the reform that implemented trial by jury. Its significance is not limited to the satisfaction resulting from the fulfillment of an ancient and consistent constitutional mandate, ordered three times in our Founding Charter and also established in the Constitution of the Province of Buenos Aires. Its significance also derives from the deepening of the guiding principles of the adversarial system, the reinforcement of the guarantee of impartiality and bringing, at the same time, the direct participation of people in the administration of justice. In this sense, the enactment by the local Legislature of trial by jury for criminal cases cannot be turned back. Having fulfilled the constitutional mandate, the jury trial represents a further and guarantee of fundamental importance that cannot be ignored without serious consequences for our Republican system. We celebrate that trial by jury has reached these latitudes to become the gateway to the XXI century, intended to leave behind definitively the remnants of the inquisitorial process that prevail for more than a century in our recent history. Just as the precedent Herrera Ulloa vs Costa Rica issued by the Inter-American Court on Human Rights and its local reply 'Casal case', ruled out by our Federal Supreme Court of Justice implied for us a new standard concerning the review of bench judges´ written judgments, it is expected that the rules governing trial by jury contribute to a better insight and standards of performance for judges, so that the advances in terms of adversarial model can guide all cases subject to criminal process in our province”.